At the southern end of the Costa Daurada is Amposta, one of the most traditional towns on the mouth of the river Ebro. Proximity to the Ebro Delta Nature Reserve makes it a favorite destination of nature lovers. The city of Alcanar is located 200 km to the south of Barcelona and is the most southest city of the Costa Dorada. The main populated areas are: the city of Alcanar and the Maritim District of Les Cases d´Alcanar. This coastal town has a beautiful historic quarter. Its historic-artistic heritage is made up of a medieval castle, the church of Sant Martí, some remains of the walls and the city hall. It is also worth highlighting the hermitage of Sant Antoni and the seaside and tourist area. The charm of Arnes is based on its very special terrain, formed by a combination of mountains and plains. The town hall is the most characteristic building of Arnes and perhaps the most beautiful structure of its kind in Catalonia. It was one of the first buildings erected here in the Renaissance style. The parish church, which is dedicated to St Mary Magdalene, is a Baroque building from the year 1693. Benifallet itself has a Romanic eremite from the XII century and a neoclassical church, but no doubt this place is well known because of its caves, also known as the "Cuevas Aumedielles". The Benifallet caves exist of 6 caves, but only 3 of them have an access nowadays and from those 3 only 2 can be visited by the public. The origins of Perelló go back into prehistory, as can be seen from the Cabra-Feixet rock paintings, which have received the World Heritage designation. The village was an important Roman settlement, and there are many remains to be seen from this period, such as part of the Via Augusta roman Road, bridges and wells. Near this little village you can find the Cartuja de Scala Dei, the staircase to god, monastery which nestles in Montsant, the holy mountain. The impressive ruins let us wonder the monastery's past splendor. 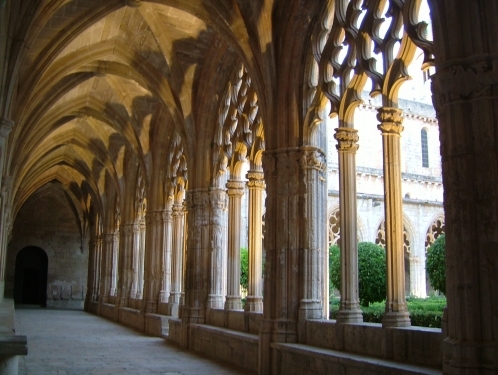 In the 12th Century it was built as the first Carthusian Monastery on the Iberian Peninsula. This is the capital of the Priorat region and situated in a small valley easily reached from the main road. In the old quarters (Casco Antiguo) you still find some remains of the old city walls and only the entrance gate el Portal del Bou remains fairly intact. Gandesa is the capital of the comarca of Terra Alta and lies 363 meters above sea level. Gandesa has a church with unusual and interesting sculptures on the Romanesque porch. The archaeological site of Coll del Moro, at a distance of six kilometers from the town, contains three necropolises from various periods and an Iberian site. This little village is known both at home and abroad for Picasso's famous phrase: "Everything I know, I learned at Horta de Sant Joan". The view of Horta becomes impressed on the eye of visitors. Horta is a town of harmony, where the medieval historical centre and the magnificent landscape that surrounds it, blend as if time stood still. The name L'Ampolla (ampoule) comes from the old shape of the Ebro River mouth. The village's most outstanding characteristic are its beaches, with a mixture of sand and stones, along with smaller coves that constitute stunningly beautiful natural landscapes. L'Ampolla has some of the best conserved areas of coastline in Catalonia, and a great deal of the area is protected. L'Ametlla de Mar, also called la Cala (the bay), is a municipality within the comarca of Baix Ebre, situated in the coastal region between the "Cap de Terme" and the "barranc de l'Àliga". Fishing continues to be one of the principal activities of the town. In the middle of the Conca de Barberà region, astride the lands of the interior and the Tarragona coast is L'Espluga de Francolí. Surrounded by a leafy natural area, this town is closely linked to wine production, as is shown by one of the architectural jewels in its historic quarter, the Modernist Wine Cellar with its Wine museum. The best way to enter this village is the very original and exclusive little ferry, Pas de Barca. Expect to pay the operator ¬ 2,50 and off you go. This little ferry is the only existing ferry which works without an engine and relays on its movement entirely on the currents in the river. Montblanc has its origins in the twelfth century, when it was founded as a royal town by the King Alfons I. During the twelfth and fourteenth centuries the town expanded and it became the seventh most important city in Catalonia. The great richness of its monumental legacy enabled Montblanc to be declared Monumental Artistic Ensemble in 1947. Montbrió del Camp is a Mediterranean, thermal village to be found in the Baix Camp region. It is a wealthy area full of panoramic landscape where agriculture, the production of olives, hazelnuts and wine, is the main economic business. 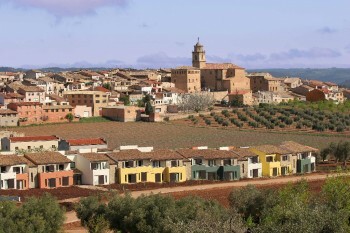 This village is known because the famous Catalan painter and artist Joan Miró spend his youth here. Somewhere that influenced his later paintings and sculptures. With the Iglesia Vella, the old church, the village created a wonderful exhibition space for art and of course Miró. Its term is full of vines that supply the farming cooperative in its wine and cava production. The almond trees, the hazels and olive trees complement the cultivations and define the different color spots of its landscape. The village is formed around the church and the walls of the old castle, in a small hill nearby the Garidells torrent. Poblet is the most important feature of the men's branch of the Cistercian order which still houses a monks' community. It was founded in 1150 having its trajectory cut in 1835 due to the Civil war. With the monks' reestablishment in Poblet, an ambitious restoration and conservation process began in 1940 which has returned to the monastery the majesty it deserves. Prades is known as the red city because of the buildings which are erected in red stone coming from the nearby mountains. It is advisable to go for a stroll and enjoy this little village, its small streets and its big Plaza Mayor. The main square is a harmonious architectural ensemble of balanced proportions and attractive colors. The first thing you'll see at the village of Riudecanyes is the massive artificial lake and the beautiful mountains surrounding it. You have to enter the village itself and follow the brown/white road signs which indicate the route to the Castle of d'Escornalbou. Riudoms was a Roman rural settlement (some archaeological remains and coins were discovered), that was depopulated when the Muslims dominated the region in the 8th century. Conquered by the Norman Robert d'Aguiló under the orders of the Catalan count, the lordship of Riudoms was granted to Arnau de Palomar on 24 January 1150. Directly at sea you find this charming little cluster of houses which are all build in different traditional Spanish architecture. This makes Roc de Sant Gaieta something like an open air museum, free of admission!! In the village itself it is not allowed to drive by car, bicycle or moped which makes it even quieter. Sant Jaume d'Enveja is situated in the southern half of the Ebre delta, the right bank of the river. The municipality was created in 1978: previously the territory formed part of the municipality of Tortosa. It is linked to Amposta by a local road and to Deltebre on the opposite bank by a service of barges. The town itself was established relatively recently in the 1860s. Founded in 1160, this monastery went through glorious stages until 1835, the year it was finally disbanded. Nowadays it is the only monastery of the Ruta del Cister which has not monastic life, allowing the visitor to discover the treasures of this magnificent cenobium where still remain in each stone the most alive memory of its history. This picturesque village is situated at a height of 737 meters and lies on top of a massive rock with steep cliffs. Siurana is visited by a lot of people but still keeps its original look with its narrow streets and old, but renovated, houses. The beautiful castle dating from the 11th century is one of the few castles which is directly situated on the beach. Recently it has been completely renovated and transformed to a restaurant and convention center. The castle is surrounded by two beaches and a pine forest. This village still has some remains from medieval times and a massive church which dominates the skyline of this area. In the nearby mountains you can still find drawings made by prehistoric men and which are nowadays protected by UNESCO, unfortunally these can only be reached by foot. Valls, birthplace of the castells (human towers) and the Calçotada (grilled spring onion festival), shows us its monumental aspect in such gems as the archpriest church of Sant Joan the 14th Century Capella del Roser, as well as making us feel a part of its characteristic festivals, fairs, traditions and customs. First news date from 1153, but it was not until 1176 it got completely integrated in the Cistercian order. It is the only monastery of the women's branch in the route that has kept the nuns community for more than 800 years with nowadays 13 nuns living in the monastery. Vallbona de Les Monges is of small size and endowed with a rare beauty, it is a clear display of the woman importance in the medieval ages.